The Beatles 4oz (approx. 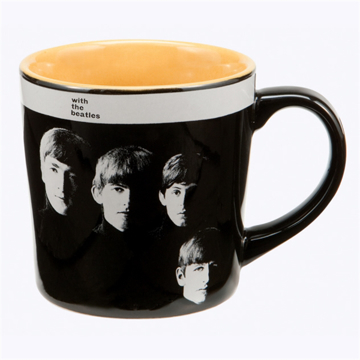 113 mls) Boxed Mini Mug in White ceramic and featuring the 'The Beatles 1965 US Album ' design motif. Comes gift packaged in a co-ordinated box, which can be stacked for display. 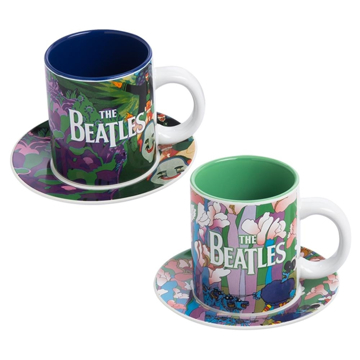 With design on one side of the mug & the Apple logo on the opposite side. Bright and colorful graphics. Makes a great gift or collector's item. The Beatles 4oz (approx. 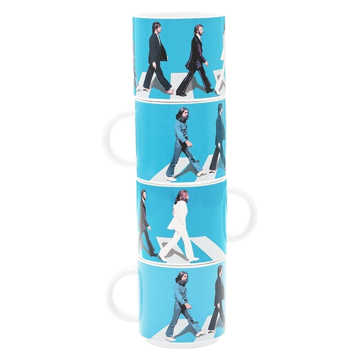 113 mls) Boxed Mini Mug in White ceramic and featuring the 'The Beatles Abbey Road' design motif. Comes gift packaged in a co-ordinated box, which can be stacked for display. 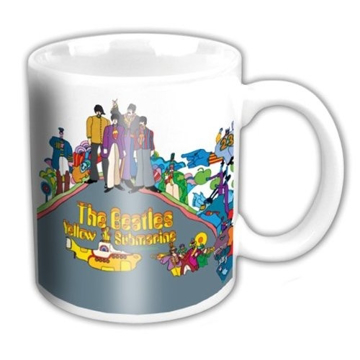 With design on one side of the mug & the Apple logo on the opposite side. Bright and colorful graphics. Makes a great gift or collector's item. The Beatles 4oz (approx. 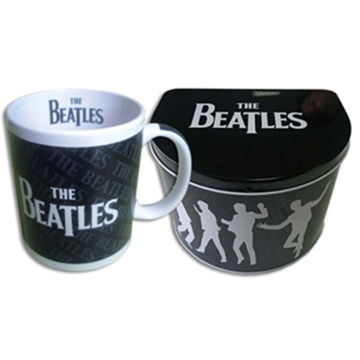 113 mls) Boxed Mini Mug in White ceramic and featuring the 'The Beatles Help!' design motif. Comes gift packaged in a co-ordinated box, which can be stacked for display. 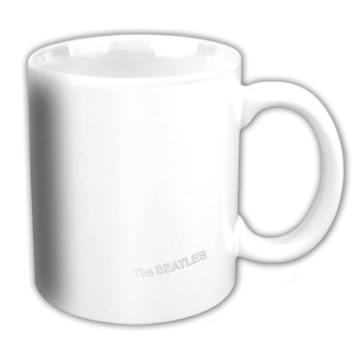 With design on one side of the mug & the Apple logo on the opposite side. Bright and colorful graphics. Makes a great gift or collector's item. 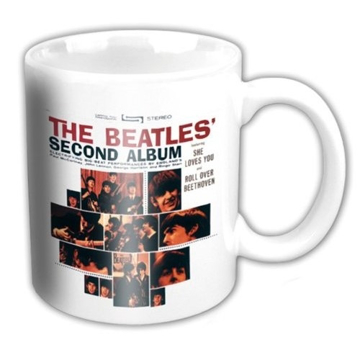 The Beatles 4oz (approx. 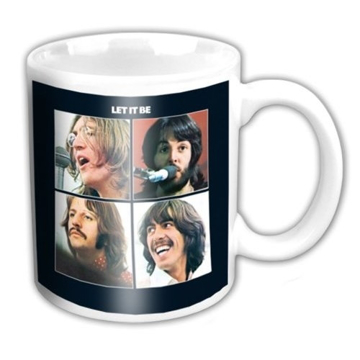 113 mls) Boxed Mini Mug in White ceramic and featuring the 'The Beatles Let It Be' design motif. Comes gift packaged in a co-ordinated box, which can be stacked for display. 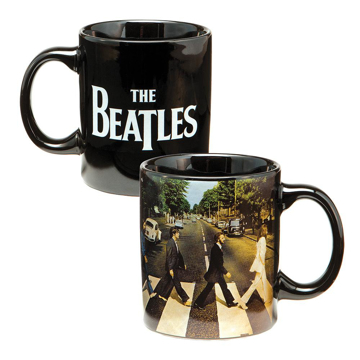 With design on one side of the mug & the Apple logo on the opposite side. Bright and colorful graphics. Makes a great gift or collector's item. 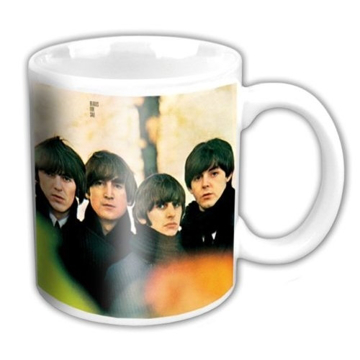 The Beatles 4oz (approx. 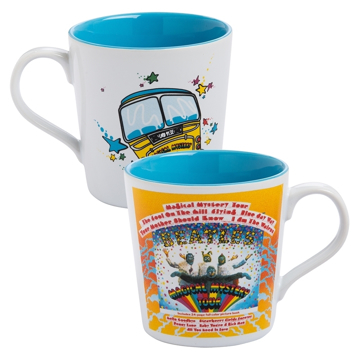 113 mls) Boxed Mini Mug in White ceramic and featuring the 'The Beatles Magical Mystery Tour' design motif. Comes gift packaged in a co-ordinated box, which can be stacked for display. 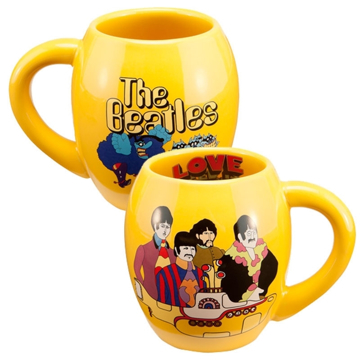 With design on one side of the mug & the Apple logo on the opposite side. Bright and colorful graphics. Makes a great gift or collector's item. 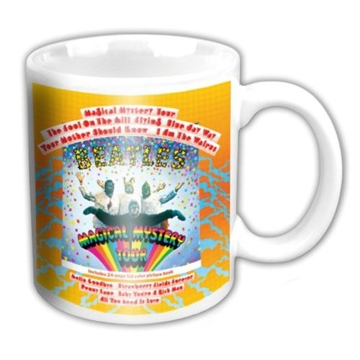 The Beatles 4oz (approx. 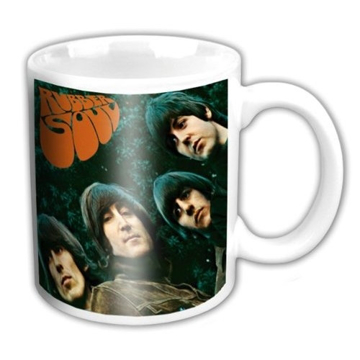 113 mls) Boxed Mini Mug in White ceramic and featuring the 'The Beatles Rubber Soul' design motif. Comes gift packaged in a co-ordinated box, which can be stacked for display. With design on one side of the mug & the Apple logo on the opposite side. Bright and colorful graphics. Makes a great gift or collector's item. The Beatles 4oz (approx. 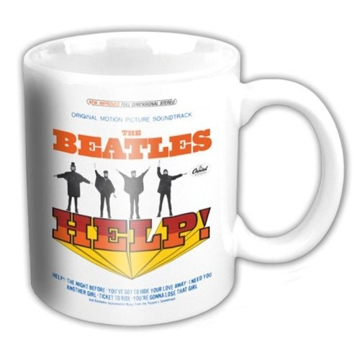 113 mls) Boxed Mini Mug in White ceramic and featuring the 'The Beatles US Album Help!' design motif. Comes gift packaged in a co-ordinated box, which can be stacked for display. With design on one side of the mug & the Apple logo on the opposite side. Bright and colorful graphics. Makes a great gift or collector's item. 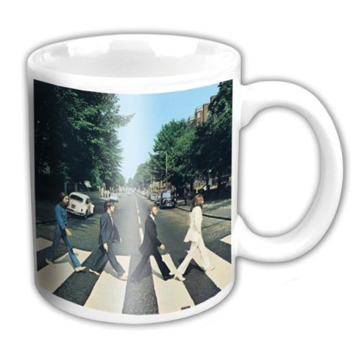 The Beatles 4oz (approx. 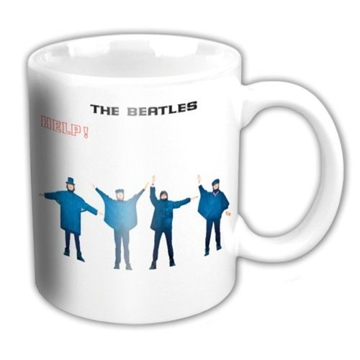 113 mls) Boxed Mini Mug in White ceramic and featuring the 'The Beatles US Album Hey Jude' design motif. Comes gift packaged in a co-ordinated box, which can be stacked for display. With design on one side of the mug & the Apple logo on the opposite side. Bright and colorful graphics. Makes a great gift or collector's item. The Beatles 4oz (approx. 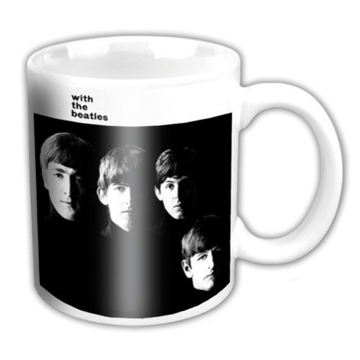 113 mls) Boxed Mini Mug in White ceramic and featuring the 'The Beatles US Album Meet the Beatles' design motif. Comes gift packaged in a co-ordinated box, which can be stacked for display. 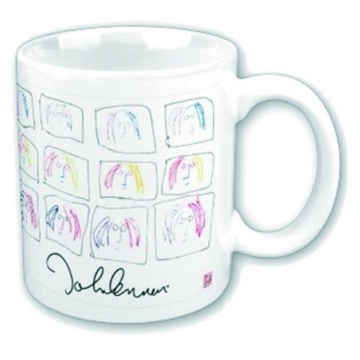 With design on one side of the mug & the Apple logo on the opposite side. Bright and colorful graphics. Makes a great gift or collector's item. 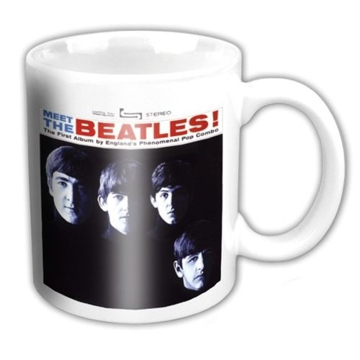 The Beatles 4oz (approx. 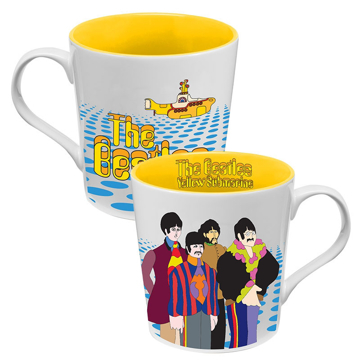 113 mls) Boxed Mini Mug in White ceramic and featuring the 'The Beatles Yellow Submarine Album' design motif. Comes gift packaged in a co-ordinated box, which can be stacked for display. With design on one side of the mug & the Apple logo on the opposite side. Bright and colorful graphics. Makes a great gift or collector's item. The Beatles 4oz (approx. 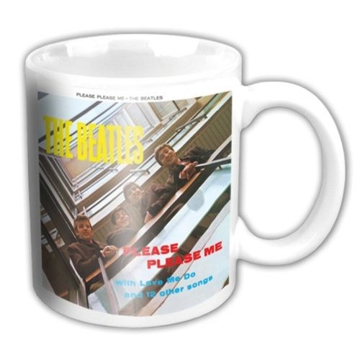 113 mls) Boxed Mini Mug in White ceramic and featuring the 'The Beatles Please Please Me' design motif. Comes gift packaged in a co-ordinated box, which can be stacked for display. With design on one side of the mug & the Apple logo on the opposite side. Holds 4-ounces with wrap around graphics. Bright and colorful graphics. Makes a great gift or collector's item. 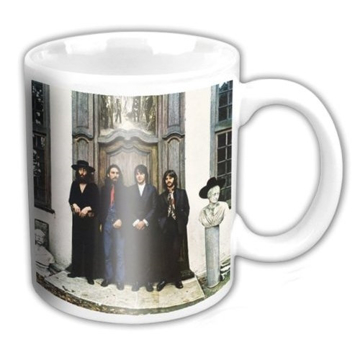 The Beatles 4oz (approx. 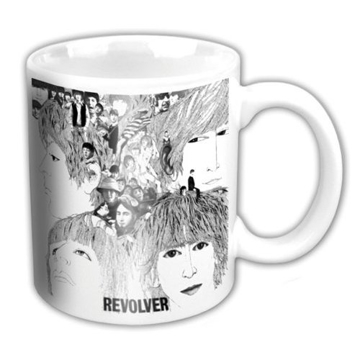 113 mls) Boxed Mini Mug in White ceramic and featuring the 'The Beatles White Album' design motif. 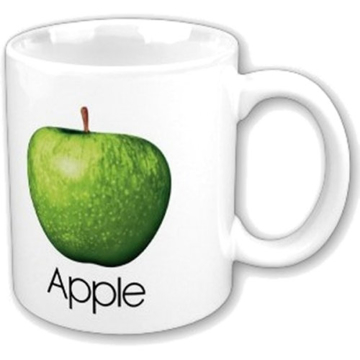 Comes gift packaged in a box, With design on one side of the mug & the Apple logo on the opposite side. Holds 4-ounces with wrap around graphics. Bright and colorful graphics. Makes a great gift or collector's item. The Beatles 4oz (approx. 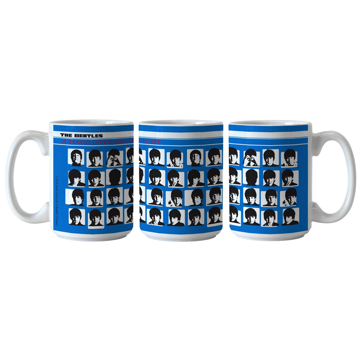 113 mls) Boxed Mini Mug in White ceramic and featuring the 'The Beatles With The Beatles' design motif. Comes gift packaged in a co-ordinated box, which can be stacked for display. 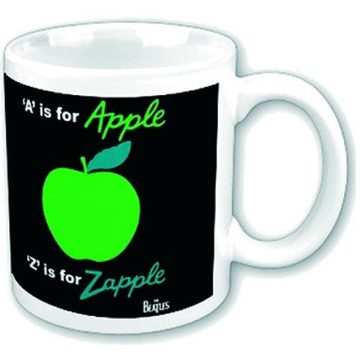 With design on one side of the mug & the Apple logo on the opposite side. Bright and colorful graphics. Makes a great gift or collector's item. 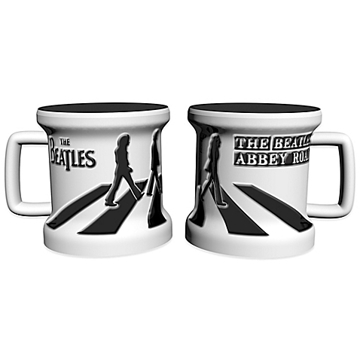 The Beatles Sculpted 2 ounce Mini Mug "Abbey Road" Holds 2-ounces with wrap around graphics. Bright and colorful graphics. Makes a great gift or collector's item. 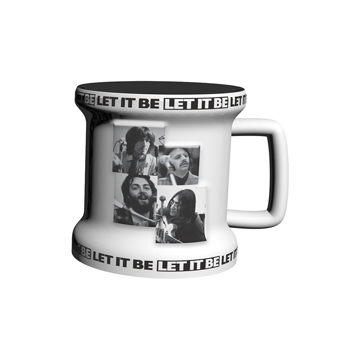 The Beatles Sculpted 2 ounce Mini Mug "Let It Be" Holds 2-ounces with wrap around graphics. Bright and colorful graphics. Makes a great gift or collector's item. 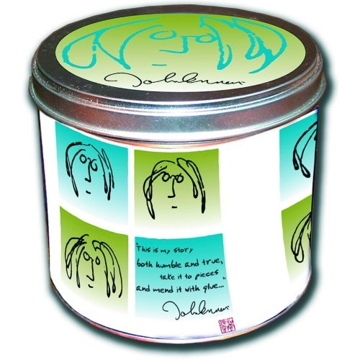 John Lennon "Portrait" Gift Set. 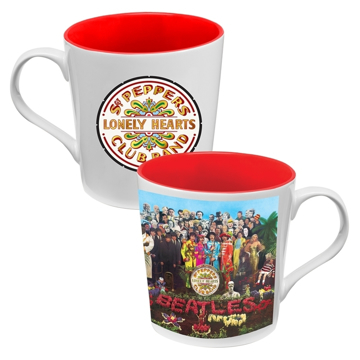 This gift set consists of a quality ceramic 16oz mug, beautifully presented in a round tin with matching artwork. 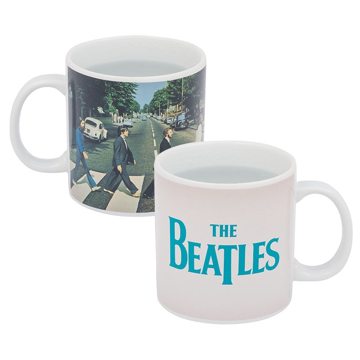 The Beatles "Song Titles Drop T" 20 oz. 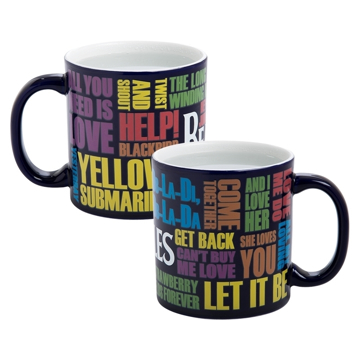 Heat Reactive Ceramic Mug Heat Reactive Design Changes When Filled With Hot Liquid Drop T logo to Beatles song titles. 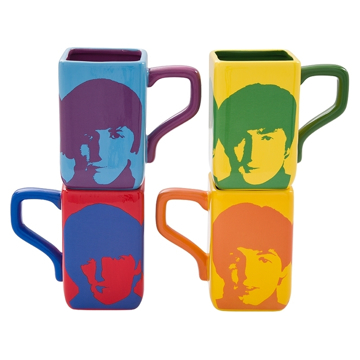 Set of Four Beatles Mugs ALL Different and ONLY $44.00. Share with Co-Workers, Roommates, Family or Friends. 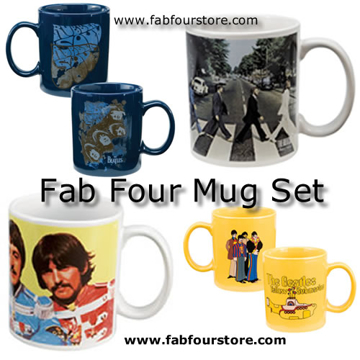 Random 4 Selected from current in stock 12-14 oz mugs. 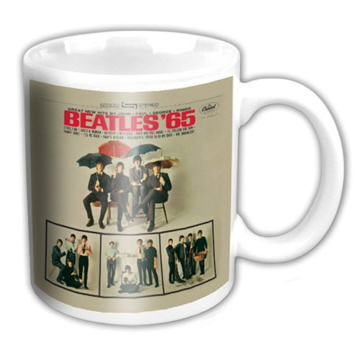 The Beatles "A Hard Day's Night" large 15 oz Decal Mug with wrap around image. The Beatles "A Hard Day's Night" RED large 15 oz Decal Mug with wrap around image.